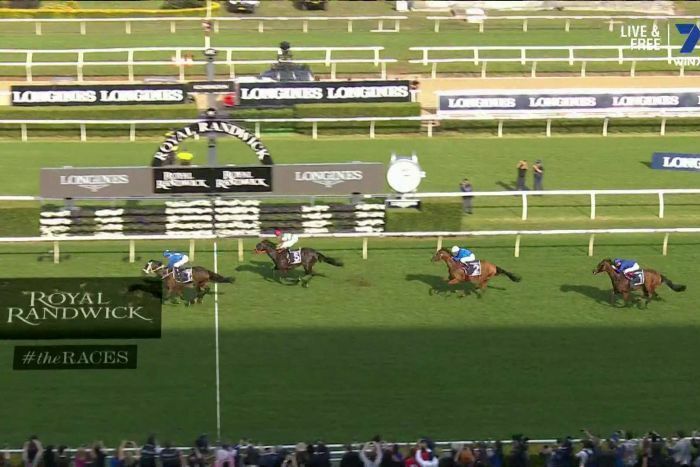 Record-breaking mare Winx has claimed her final race victory in one last dominant performance in the Queen Elizabeth Stakes at Royal Randwick. The Hugh Bowman-ridden horse signed off in typical fashion on Saturday, breezing through the field before pulling away to win ahead of Kluger and Hartnell at The Championships meeting. The victory means the seven-year-old mare has extended her winning streak to an unprecedented 33 consecutive races, including an incredible 25 Group One victories. Winx has also claimed her 20th victory at Randwick, where she has picked up the vast majority of her 33 race wins. An emotional Bowman said the number of people who had come to see Winx’s last-ever race was overwhelming. “[I’m] so proud to be a part of it. It has been very real for me all day, with the amount of people here, it is just amazing,” he told the Seven Network. “Everyone watching around the world … America, Europe, Africa, all over Australia. “This horse has captured the hearts of a lot of people around the globe. “There is really nothing more for me to say. I mean, she just showed you what she is capable of doing. Owner Chris Waller said he was glad the fairytale ended as he hoped it would. “I hadn’t thought about winning a race like today ever in my lifetime. And it is such a special moment to share it with not only my beautiful wife and my beautiful children, but the beautiful people who have been right behind Winx,” he said. “Whether they are here at Randwick today, but all around Australia, New Zealand, the world. Thank you very much.